Karen L Messick Photography: Watermen's Harbor, Kent Island, Md. On the way to the beach today, I decided to stop at one of my favorite Maryland places to photograph, The Watermen's Harbor on Kent Island. It was a cool overcast day, but I wanted to see if there was anything interesting to photograph. I parked and started walking around and soon I began to see a few images. As I walked I noticed a work boat pull up to the end of the dock and he began to unload his catch from the morning on the bay. So I made my way to the end of the dock and observed the process. 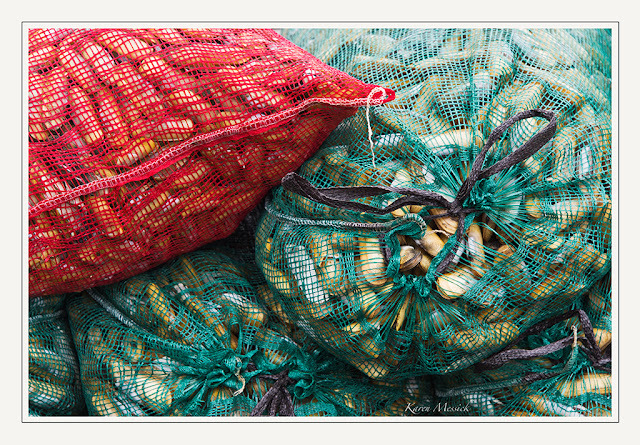 Ignorant to the actual catch in the bags I asked, and he said they were "Bait Clams" or Razor Clams, so I watched him load the back of the pick up with colorful bags of "Bait Clams." Bait clams are purchased by crabbers to bait their traps. Shortly after I arrived at the dock, another truck pulled up and two more men got out of an old truck. 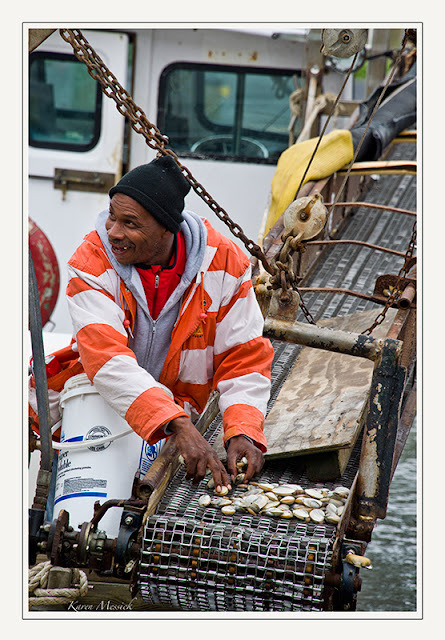 One of the men immediately went to the boat and began scooping up a small collection of clams on the boat. As I moved in to make images of him picking up the loose clams he said to me "you a news lady? tell the state of Maryland to do something, these are endangered." Well those were the eating kind of clams, we used to enjoy so much, but now are scant in the bay waters. My guess is those few bay clams didn't make it back into the bay...instead his dinner plate! I was glad I stopped! 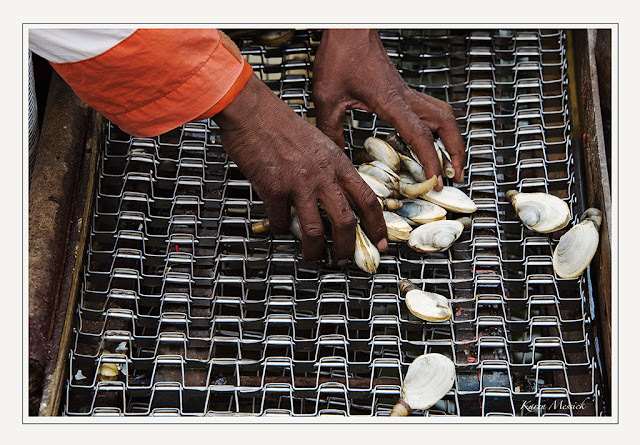 Here's a link to an article from the Sunpapers on the declining Maryland Bay Clam population. 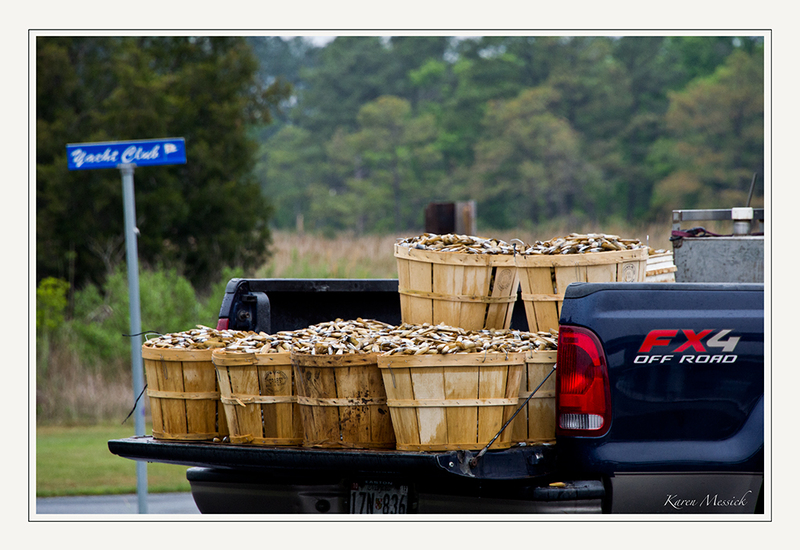 As I was walking back to the car I caught another shot of "bait claims" heading to market. 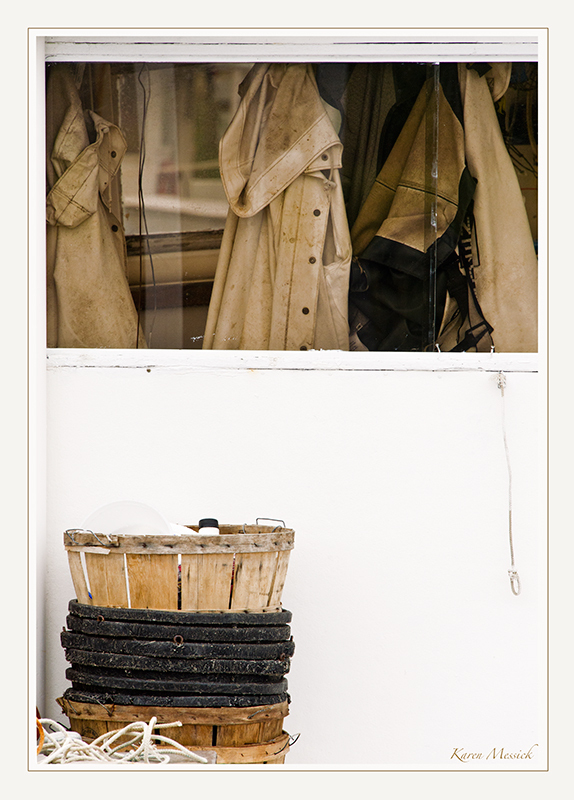 Loved this still life for the tones of the baskets and the tones of the waterman's jackets hanging inside the boat, visible through the window.